China Shopping Bag manufacturer, Non Woven Bag, Paper Bag supplier - Cangnan Haibei Bags and Cases Co., Ltd.
Shopping Bag, Non Woven Bag, Paper Bag manufacturer / supplier in China, offering Drawstring Gym Bag (HBDR-010), Eco Ice Cool Bag, Insulated Cooling Bag, Picnic Lunch Cooler Bag (HBCOO-12), Insulated Non Woven TNT Cooler Bag, Picnic Bag, Lunch Bag, for Food, Drink Bottle, Beer Can, Ice Cooling, Shopping Box and so on. 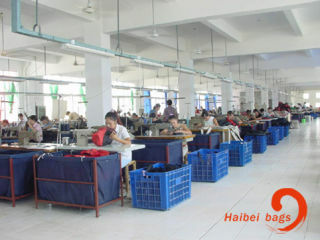 Cangnan Haibei Bags and Cases Co., Ltd. Located in Wenzhou, the active city of Zhejiang Province in China, specializes in bags made of all kinds of soft material, such as PP non woven(lamination), PP woven, cotton, canvas, Jute, organic cotton, polyester, Micro-fibre, PVC, PET fabric and PET lamination. We can make the printing and lamination by ourselves.